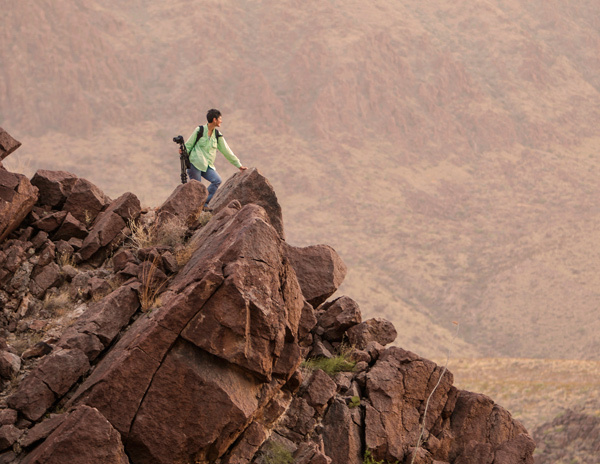 Trails provide the easiest access to many areas of Big Bend Ranch State Park. Our trails showcase nature, history and dramatic scenery, while capturing the spirit of this land. People of all ages, abilities and interests can find suitable trails. Many trails are available for hiking, mountain-biking and horseback riding. Some trails are only for hiking because of rough terrain. 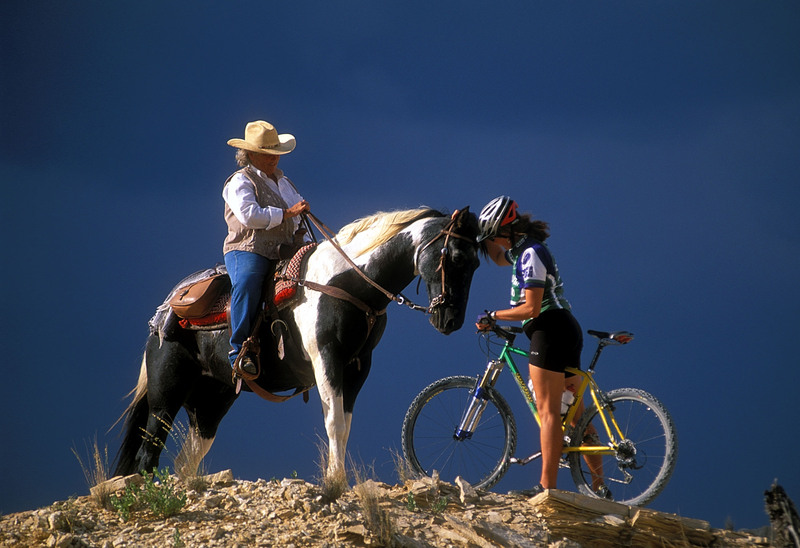 Park maps show both routes and trails; routes are not suitable for bikes and horses. Most hiking trails are primitive, with rock cairns and few signs. Experienced hikers can explore cross country. Always use a map when hiking at Big Bend Ranch State Park. Two short trails near the Sauceda Ranger Station offer differing views of the park. The one-mile Ojito Adentro Trail crosses desert scrub into an oasis-like area with great wildlife viewing. The ¾-mile Cinco Tinajas Trail offers views into a deep canyon with a series of tinajas, or rock pools that hold water after rains. Other trailheads lie along FM 170. The 3.2-mile Cerro Chilicote Loop Trail makes a great day hike. More adventurous hikers can explore a series of connecting trails and loops dropping into Fresno Canyon, Arroyo Primero and lower Arroyo de los Mexicanos. Are you interested in the park’s magnificent geology and capable of a strenuous self-guided day hike with some canyoneering? Then try this hike: In and Out of Time: Geologic Hike of Los Portales Shutup and the Righthand Shutup, El Solitario. Pick up the brochure and map at the Sauceda Ranger Station. Due to the rugged nature of the route, which includes a 750’ elevation gain/loss, a backcountry permit is required. You will need a 4WD high-clearance vehicle to get to the trailhead in Fresno Canyon. Refer to park maps or speak to a ranger when choosing a trail for your activity. Always carry a map when hiking and biking in the park. For information on guided hike or bike trips, see the Ranger Tours section above or visit the Outfitters page. Carry plenty of water and wear appropriate protective clothing. When biking, always wear a helmet and carry two spare tubes. Most importantly, have fun! Chihuahuan Desert Bike Fest: Mountain bikers descend on the park in February for this annual bike fest. Staff members lead three days of guided trail rides. In 2014, over 470 riders participated. The park’s Fresno-Sauceda Loop has been designated an “Epic” ride by the International Mountain Bicycling Association. The 54-mile loop ride is the only Epic ride in Texas, and one of two in the southwestern United States. Exploring Big Bend Ranch State Park on horseback is a true “wild west” experience. Horses can be ridden in most areas of the park. Mules are allowed, also. Some campsites have pens. Agua Adentro Pens is the best base for a horseback trip. See the Equestrian page for more information. Visit our Outfitters page to find a local stable. Visitors with high-clearance four-wheel-drive vehicles can tackle nearly 70 miles of unmaintained dirt roads in the park. These roads were used for fence building, water line construction, livestock wrangling and mineral prospecting and mining. Download the Roads to Nowhere guide for detailed 4x4 drive descriptions. For a day trip, visit the Rio Grande/Rio Bravo corridor to raft, canoe, picnic and fish. Several access points lie along FM 170. Colorado Canyon includes Class II and III rapids. This section of the river is not dangerous except during floods. Raft trips can be arranged through local outfitters. Most visitors come to the park for the scenery. Exposed geology is part of the scenery here in Big Bend country. Geology ultimately determines where and how the region’s plants, animals and humans live. As you soak up the dramatic scenery, remember that you are looking far back into geologic time. To learn more, visit the Nature page. Birding: More than 300 bird species live in the park’s various Chihuahuan Desert habitats: grasslands, desert scrub, canyons, and riparian woodlands and thickets. For more information on birding in the park, visit the Bird-watching section of our Nature page.